We recommend this Certified Project Management Workshop for teams with little or no project experience, teams with mixed levels of experience, and teams requiring intensively practical project management training. It's a highly effective way to provide your team with a strong foundation in project management excellence. Over 4 days, we will cover each stage of a project’s lifespan, from planning and executing to closing the project. We also look at how to manage project teams, and engage with stakeholders. Why Choose Certified Project Management In-Company Training? Your team will benefit from the ability to immediately apply the learning from this course to active projects. When planning the training, we can schedule it to coincide with a project you would like to bring special attention to. This course and its assessment work lead to a QQI Level 6 certification in project management. We have developed the content of this workshop to align with the Project Management Institute (PMI)® framework. This will give your team a proven, structured approach for their project management processes, and a common language during all stages of a project. Customisation is one of the key benefits of choosing in-company training. In customising this course for your team, we can focus on challenges and processes that your team encounter on a regular basis. Why Choose In-Company Training for Project Management? 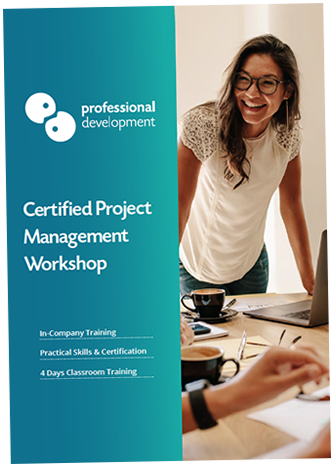 When delivering this Certified Project Management course to your team, we can tailor the content to address a project your team are currently working on or planning for. You will also ensure that all members of the team receive training in the same approaches and terminology. This contributes to the smooth running of projects and enables your teams to be more efficient. By choosing an in-company format, you’ll eliminate travel costs for your team and minimise any disruption to your working schedule. You also gain the option to choose dates that suit your business calendar best. The pricing structure we offer for in-company training works out as much more cost-efficient than public courses, in cases where a number of people require training. To find out more, contact us by phone on Freephone 1800 910 810, or click below to ask a question. Alternatively, you can request your in-company quotation by clicking “Get In-Company Quote" near the top of this page. What Steps are Involved in Gaining Certification? Schedule and run our Certified Project Management Course for your team. Each participant will need to complete a period of self-directed learning, and assessment work in the 8 weeks following the last day of their course. Assessment work includes a project portfolio of work and a written assignment. Self-directed learning includes research, reading, study, practice, reflection and preparation of assessment work. We will provide each participant with a detailed assessment brief, and guidance for completing the work and self-directed learning. Participants must submit their assessment work within 8 weeks of completing their training. Participants will receive their QQI certificate approximately 5 - 6 months after they have submitted assessment work, and received a passing grade.